Revealed for the first time, the final art for the Black & White Minimal Trade Dress version of our Joshua Middle Batman #50 exclusive! The big night is almost here! On Tuesday, July, 3rd, we'll reopen the doors at 11:30 PM, at which time we'll have light refreshments and a toast to the (hopefully) happy couple. Then at midnight, all of the week's releases go on sale, not just Batman #50, which include Catwoman #1 by Joelle Jones with an Artgerm variant, Captain America #1 by Ta-Nehisi Coates & Leinil Francis Yu, and Cosmic Ghost Rider #1 and Death of the Inhumans #1 by Donny Cates! 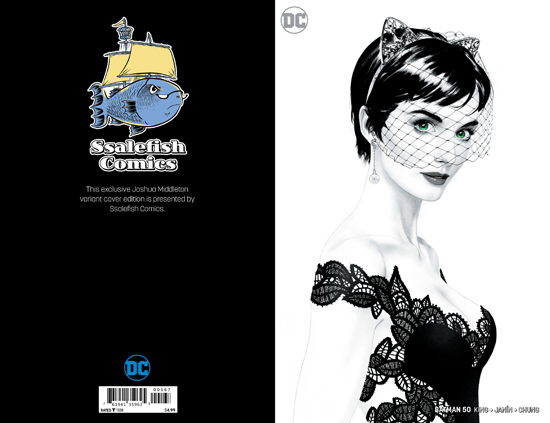 A reminder that in-store you may purchase 1 copy of the full color, full trade dress version (limited to 3,000 copies worldwide) of our Ssalefish exclusive variant for the standard $4.99 cover price, with any additional copies that you'd like for $20 each. The black & white, minimal trade dress version is $20 as well (limited to 1,500 copies) and we have a very limited number of the sets of 3 that include the full color, virgin version (limited to 1,000 copies) available in-store ONLY (all 900+ online pre-orders have SOLD OUT) for $50! Before anyone asks, you can't use the $4.99 full color offer as a discount on the whole set. We'll also have the regular Mikel Janin, Jim Lee, Arthur Adams, and blank variants available in quantity for cover price, and the 1:100 Jim Lee pencils only sketch variant for $50! It'll be a night you won't forget, and we've got some other surprises in store for regular business hours on Independence Day, so stay tuned to our Facebook for details! Ant-Man & the Wasp #3 - we'll be at the AMC Classic 18 on Koger Blvd. at 6:30 on Thursday, July 5th to hand out classic reprints of the dynamic twosome before the movie debuts! Astonishing X-Men #13 - it's a bold new direction for the team with new series writer Matthew Rosenberg, creator of 4 Kids Walk Into a Bank and We Can Never Go Home! Batman #50 - see above for details! Batman by Grant Morrison Omnibus HC - from the introduction of Damian Wayne to Batman Incorporated, it's all right here and all oversized! Batman Thrillkiller TP - I've never read this one, but it's always looked curious! Captain America #1 - picking up on the Free Comic Book Day special, Black Panther writer & MacArthur Genius Grant recipient Ta-Nehisi Coates joins up with Secret Invasion artist Leinil Francis Yu for a run on the Sentinel of Liberty! Blank, John Cassaday, Marko Djurdjevic, Ron Garney, Adam Hughes, Joe Jusko, Paul Renaud, Yu, and Mike Zeck variants available for cover price, plus David Mack and Jim Steranko offerings for a mark-up! Catwoman #1 - what better book to go with your Batman #50?! Artgerm and blank variants available for cover price! Cosmic Ghost Rider #1 - spinning out of Donny Cates's smash on Thanos, Mike Deodato variant available for cover price, with marked-up Stephanie Hans and Mark Brooks covers also up for grabs! DC Nation #2 - a FREE look inside DC Comics! Death of the Inhumans #1 - Donny Cates introduces a brand-new villain that looks to end the failed Kree experiment for good! Deathstroke #33 - "Deathstroke vs. Batman" part 4! Go Go Power Rangers #11 - "Shattered Grid" tie-in! I Hate Fairyland #20 - Bill Sienkiewicz, Jeff Lemire, Jock, Chip Zdarksky, and uncensored variants available for cover price! Incognegro Renaissance #5 - final issue! Infinity Countdown Champions #2 - final issue! Man of Steel #6 - final issue! Project Superpowers #0 - you're reading that right, it's a Franchesco Mattina cover for just a dime! Pumpkinhead #5 - final issue! Quantum Age #1 - in the vein of Doctor Star and Sherlock Frankenstein, this is a standalone mini series taking place in the world of Black Hammer! Shade the Changing Woman #5 - now a six issue mini series! Tangled #3 - final issue! True Believers Fantastic Four Coming of Galactus #1 - reprinting Fantastic Four #48! True Believers Fantastic Four Wedding of Reed & Sue #1 - reprinting Fantastic Four Annual #3! Unnatural #1 - calling this as the dark horse hot book fo the week! Walking Dead #181 - Bill Sienkiewicz variant available for cover price!